Is There a Version of loop_in_chunks for dft_chunks? As described in Computer Physics Communications, Vol. 181, pp. 687-702, 2010, Meep subdivides geometries into chunks. Each chunk is a contiguous region of space — a line, rectangle, or parallelepiped for 1d/2d/3d Cartesian geometries, or an annular section in a cylindrical geometry—whose sizes are automatically determined by libmeep. In parallel calculations, each chunk is assigned, in its entirety, to precisely one process — that is, no chunk exists partly on one processor and partly on another. For calculations that exploit symmetry, only a portion of the full grid is actually stored in memory, and obtaining values for field components at a point that isn't stored requires a tricky procedure discussed below. Similarly, for Bloch-periodic geometries, only grid points in the unit cell are stored, but we may want the fields at a point lying outside the unit cell, again requiring a bit of a shell game to process correctly. Because of the staggered nature of the Yee grid, "looping over grid points" can mean multiple things — are we visiting only E-field sites, or only H-field sites, or both? 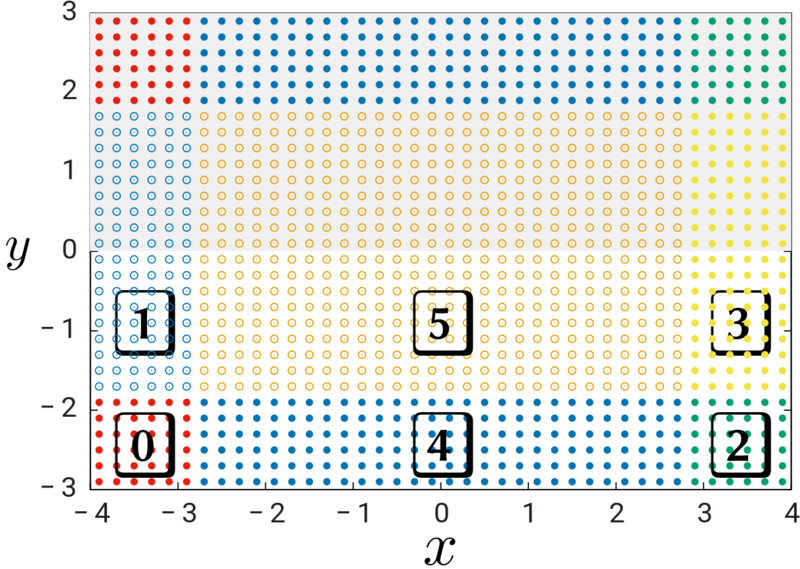 Either way, obtaining a full set of field-component values at any one grid point necessarily involves a certain average over neighboring grid points. To shield developers from the need to grapple with these complications when implementing loops over grid points, libmeep provides a convenient routine called loop_in_chunks and a set of macros that take care of many of the above hassles. This is discussed in more detail below. For each chunk in a geometry, libmeep creates instances of the data structures structure_chunk (storing data on the geometry of the chunk and the material properties at grid points in the chunk) and fields_chunk (storing the actual values of the time-domain field components at grid points in the chunk). Frequency-domain (DFT) field components are handled by a separate data structure called dft_chunk. 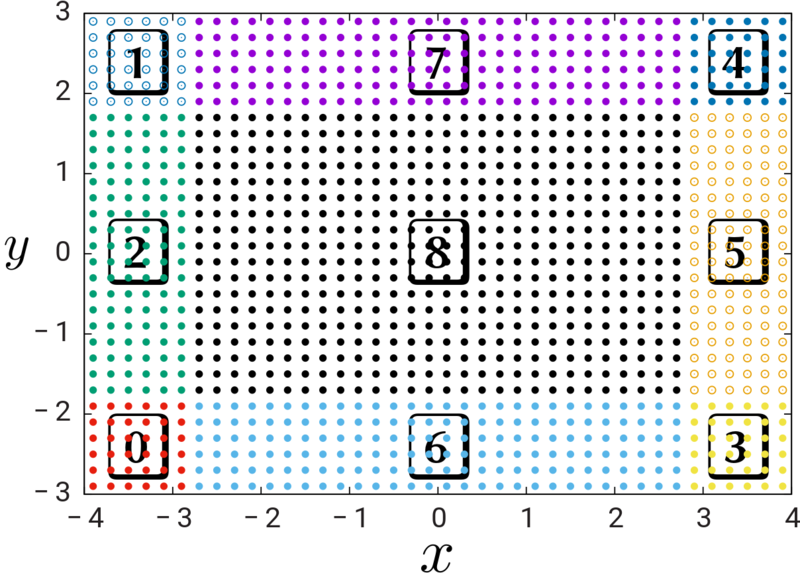 Each instance of dft_chunk is associated with a single instance of fields_chunk (namely, whichever one stores the time-domain fields at the grid points covered by the DFT chunk); however, because DFT fields are typically only tabulated on a subset of the full grid, the grid volume covered by a dft_chunk may be only a subset of the volume covered by its parent fields_chunk, and not all fields_chunks have dft_chunks associated with them. Our running example throughout this page will be a 2d geometry, of dimensions , with PML layers of thickness 1 on all sides, discretized with 5 points per unit length to yield a 40 × 30 grid. The width of the 8 chunks around the perimeter is set by the PML thickness. Note that the chunks are not of uniform sizes and that their ordering is somewhat arbitrary. In particular, consecutive chunks are not necessarily adjacent. As noted above, each chunk is a contiguous region of space defined by a Cartesian product of intervals for each coordinate; to specify the extents of the chunk it thus suffices to specify the endpoints of the interval for each coordinate, or equivalently the coordinates of the lower-left and upper-right grid points in the chunk. For each chunk, these are represented by ivecs named is and ie (stored in the fields_chunk and dft_chunk structures). In this case we have is=(29,-29) and ie=(39,-19). 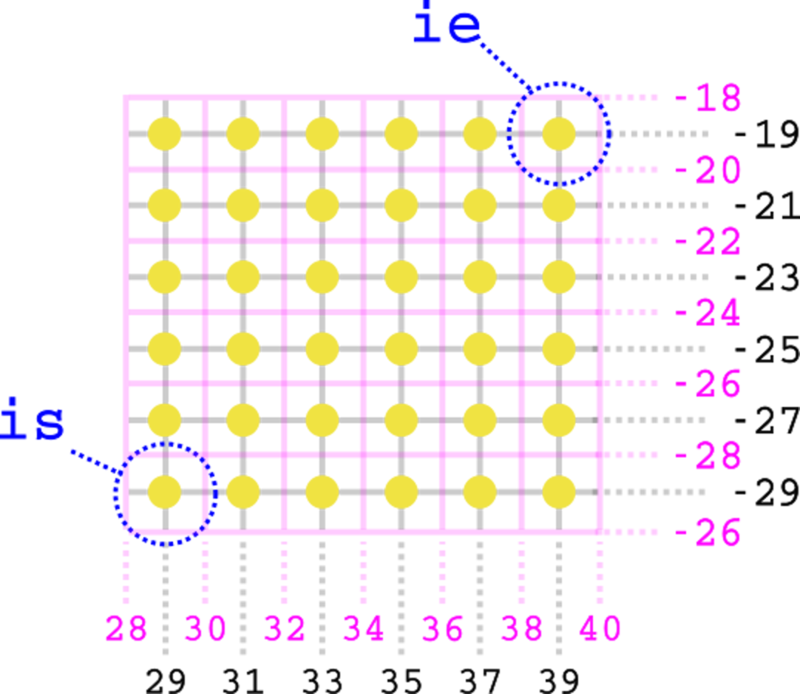 In this image, grid points with different coordinates (different heights off the plane) are handled by different processors, while points with the same coordinate but different colors live in different chunks. In this case, processes 0, 2, 5, and 7 each own 4 chunks, while processes 1, 3, 4, and 6 each own 2 chunks. Meep's approach to handling symmetries is discussed from the user's perspective in Exploiting Symmetry and from a high-level algorithmic perspective in Computer Physics Communications, Vol. 181, pp. 687-702, 2010. The following is a brief synopsis of the implementation of this feature. For each orbit, field components are only stored for the parent, not for any children. This reduces memory requirements by a factor , the number of points in each orbit, known in meep as the ``multiplicity'' of the symmetry; for example, for a geometry with Y-mirror symmetry, for an XY-mirror symmetry, for an N-fold rotational symmetry, etc. (2) apply the transformation to both the grid-point coordinates and the field components of the parent point to yield the coordinates and field components of the th child point, i.e. If the materials are anisotropic (i.e. the permittivity and/or permeability are tensors) we must transform those appropriately as well. (3) use the coordinates and field components of the child point to carry out the operation in question. 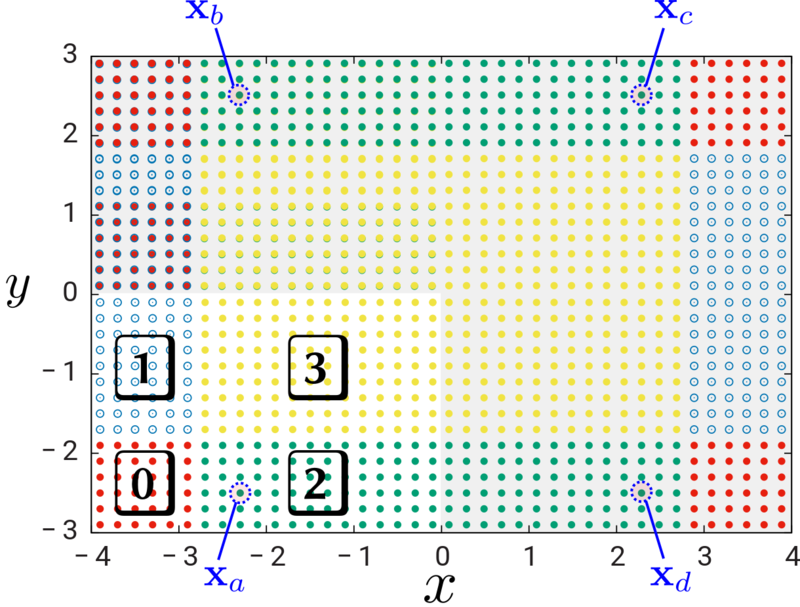 In these figures, points in shaded regions are "children" — that is, points for which Meep stores no field components, since they are related by symmetry to "parent" points in the unshaded region. In the second figure we have indicated one complete orbit: parent point is carried to child points under the operations of the symmetry group. To allow developers to implement loops over grid points without stressing out over the various complications outlined above, the fields class in libmeep offers a convenient method called loop_in_chunks. To use this routine, you will first write a "chunk-loop function" which carries out some operation involving grid points and (optionally) field components at grid points. Then you pass your routine to loop_in_chunks with some additional arguments customizing the type of loop you want (see below). Your loop function will then be called once for every chunk in the problem---including both chunks whose fields are present in memory, and those whose aren't due to being eliminated by symmetry---with a long list of arguments describing the chunk in question. The body of your chunk-loop function will typically want to execute a loop over all grid points in the chunk. This is facilitated by a host of utility macros and API functions that operate on the arguments to your function to yield quantities of interest: grid-point coordinates, field-component values, etc. Notwithstanding this formidable-looking beast of a calling convention, most of the arguments here are things that you can blindly pass on to API functions and convenience macros, which will return quantities whose significance is easy to understand. 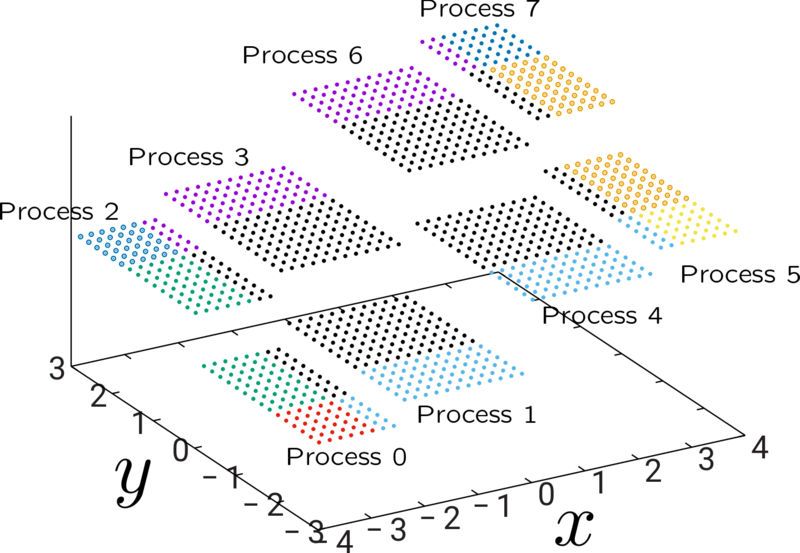 No, but the routine process_dft_component() in src/dft.cpp effectively implements such a routine for a hard-coded set of operations on DFT components (namely: outputting to HDF5, fetching DFT array slices, and computing mode-overlap coefficients). The images above were obtained with the help of a simple C++ code called WriteChunkInfo that calls libmeep API functions to obtain info on the chunk structure of the 40×30 grid we considered. This code (plus a simple hand-written Makefile) lives in the doc/docs/Developer_Codes subdirectory of the meep source distribution.